The Humboldt Bay Harbor, Recreation and Conservation District was formed by California legislative action and also by an initiative of Humboldt County voters in 1972. The District runs the Port of Humboldt Bay and has jurisdiction over tidelands, but it was also vested with other areas of jurisdiction, including coastal estuaries and the access to the ocean at Shelter Cove. We have been partners at Shelter Cove helping maintain access in a significant way. An example is former Second Division Commissioner Roy Curless spear-heading the drive to rebuild the breakwater in Shelter Cove, which cost $1.5 million granted by the Division and Boating and Waterways, and took over a decade to complete. The local governmental entity is the Shelter Cove Improvement District, but it lacks the capacity and jurisdiction to obtain and administer large grants and to cope with some side effects of commercial and sport fishing. Shelter Cove fish cleaning station on July 27, 2016. In addition, the area immediately next to the fish cleaning station and launch has been in disrepair. A former tenants property improvements were lost in a fire in 2015, leaving a burned out ruin as a back drop for access to one of the most spectacular places to launch a boat and fish on the West Coast. 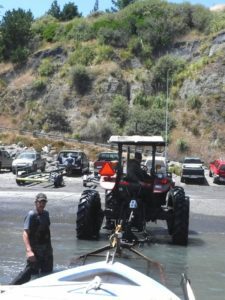 Also, the tractor launch service was not consistent in its operation and anglers sometimes waited for hours to get their boats on the water. 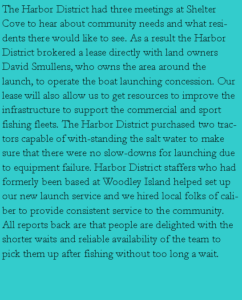 Luckily, the Harbor District came up with a solution for the fish cleaning station, improving the launch service, and a significant level of increased services in the area at the top of the boat landing ramp. Harbor District crew doing a smooth pick up and there was no wait for incoming service. 7/27/16. 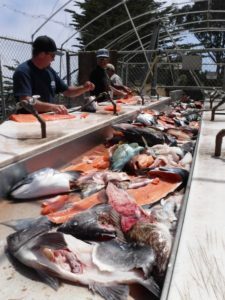 The Harbor District is getting a grant to get freezer capacity to take fish waste from the fish cleaning table and preserve it for crab bait. Fish offal will be collected by an organic fertilizer producer. In addition, we are seeking another grant to build a suite of buildings to house the launch tractors, to buy and sell fish and to purvey supplies to sport and commercial fishermen and the public. The plans for building improvements are exciting and the project could happen by 2018. Conceptual drawing of new Shelter Cove building that the Harbor District is pursuing a grant for. By Harbor District Engineer Mike Foget. 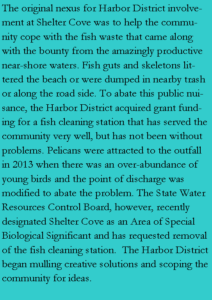 The Harbor District was spending about $20,000 per year to maintain the fish cleaning station. Since our staff assumed fish cleaning station duties, and our boat launching services and other fees helped us get almost into the black, we were able to be more fiscally responsible and increase public service. As a Harbor District Commissioner, I am extremely happy for us to be able to assist the Shelter Cove community and to be able to make the access to the ocean easier and affordable, while also improving the visual appeal of the land surrounding the ramp. We think we helped improve the experience of both local anglers and those visiting. In the long term, we hope to work in partnership with the community to help improve economic vitality.